Liverpool midfielder, Fabinho revealed that Roberto Firmino played a vital role in convincing him to join Liverpool. 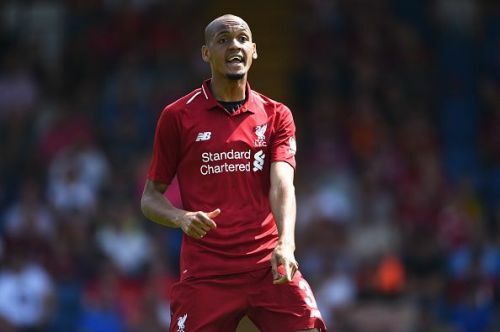 Fabinho joined Liverpool from AS Monaco in the last summer transfer window, and he has established himself as an essential member of the Reds squad after struggling during the opening few months of the season. The Brazillian acts as a shield in front of the Reds defence and has helped the Merseysiders maintain the best defensive record in the league. This season, he has made 2.1 tackles per game and has also completed 22 interceptions in England's top-flight. Apart from that, he also contributed one goal and two assists to the team. “Bobby played an important role in me coming here. Before coming here, I’d spoken to him about what it’s like at the club and what the city is like as well as the good areas to live in. The Brazillian also lifted the lid on how it feels to play under Jurgen Klopp. “He’s a coach who demands a lot and is very close to his players. I think that both the coach and the coaching staff try to get the best out of the players. Liverpool are currently at the top of the Premier League table and are scheduled to play against Tottenham Hotspur next.